Beeswax acts as a natural waterproofer, sealing the leather and protecting it from harsh elements. In addition, beeswax functions as a moisturizer, softening stiff, rigid leather. Pure sweet almond oil is rich in vitamins A, E, and B. It's a preferred ingredient in natural health and beauty products. It's hypoallergenic and safer than less expensive alternatives. It has many wonderful health benefits and works to improve the overall look and feel of leather goods. With these ingredients involved, this balm is safe to touch with the hand. No animal fats, synthetic compounds, preservatives or petroleum based products. Rest assured your products will be protected and brought back to life with the perfect combination of ingredients designed to help the longevity of your leather good. Once applied, you'll want to show off how great those boots look, or how your wallet has taken on a new life! Thank you for joining us. 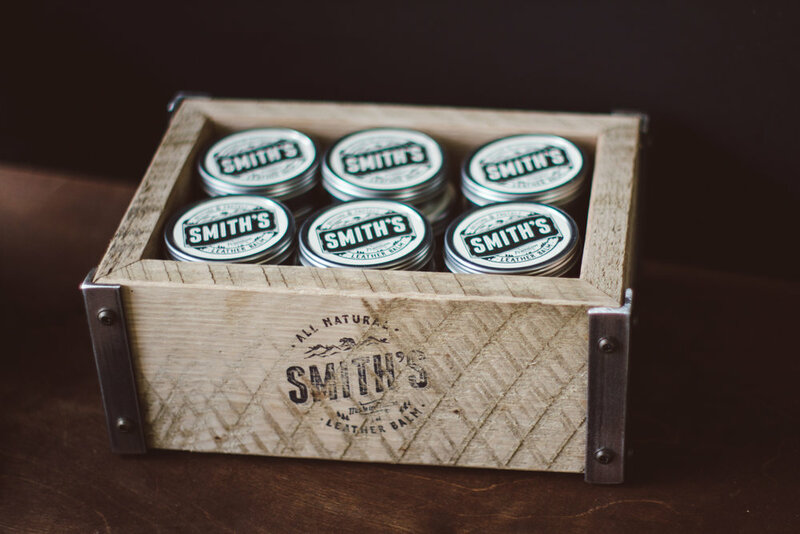 We are really excited to bring Smith's Leather Balm on board and hope you pick-up a tin for yourselves. That way you can rest assured your leather goods are taken care of and know that you aren't ingesting terrible chemicals. Listing to purchase is below!